Chameleons are amazing creatures, but they aren't the best pets for everyone. Since their care requirements are quite specific and they are easily stressed, chameleons are not for the beginner herpetologist. But true chameleons (also referred to as old world chameleons) known for their ability to change color, make fascinating pets for those up to the challenge. Young chameleons are usually a dull gray/brown color and can change shades a bit. At around five months of age, the adult color and the ability to change colors develops, and a range of colors including green, blue-green, turquoise and black can be seen. Changing colors provides camouflage, temperature regulation, and a means of communicating with other chameleons. Colors change in response to excitement, stress, temperature, lighting conditions, the presence of another chameleon, and other influences. Generally, a dark brown to black chameleon is stressed, with the brighter colors reflecting a happier mood. Chameleons use their tongues to catch prey. A chameleon's tongue can be up to 1.5 times the length of its body, allowing chameleons to catch insects from a distance. They primarily eat insects, but some will eat vegetation and small invertebrates. Chameleon feet have three toes pointing in one direction and two that point the opposite way, which gives them a good grip on the tree branches they spend most of their time on. Many species also have prehensile tails. They have globular eyes which rotate like turrets and move independently, allowing them to scan a wide radius to hunt for food and look out for predators. When selecting a pet chameleon, it is best to find a captive bred one. Wild caught specimens are usually extremely stressed, carry a heavy parasite load, and have difficulty acclimating to captive conditions. Chameleons are not the hardiest nor easiest reptiles to keep, and starting with a stressed pet will only make matters worse. In addition, the capture and shipping of chameleons (which fortunately is being more tightly regulated) results in the deaths of many animals. Many more die in transit than make it to the pet store. Once you've found a captive bred chameleon, observe them. They should be bright and active, able to change colors, and have a well-fleshed body. Being territorial and solitary animals, chameleons should be kept by themselves; males are especially aggressive toward one another. 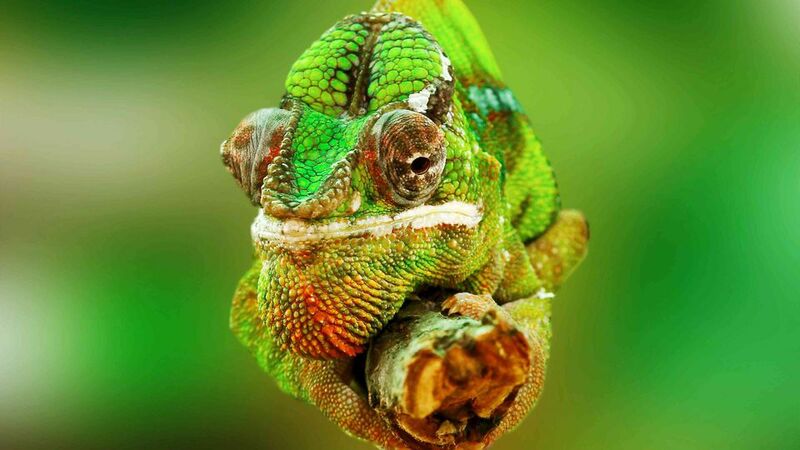 The natural habits of chameleons make them tricky to care for. Chameleons are arboreal, meaning they live exclusively in trees. They need cages with ample foliage for climbing and privacy, and the enclosure must be quite large. For the larger chameleons a cage measuring 3 feet by 3 feet by 4 feet tall should be provided, but the more space the better. Ample ventilation is required, and a cage screened on three sides is best with poly mesh or vinyl coated wire preferred to prevent toe injuries. Branches of various diameters need to be provided for climbing and the bulk of the cage space should be filled with these branches or live foliage. Ensure that the plants are not toxic, as the chameleon may eat the foliage. Substrate made up of small particles (such as gravel, sand, bark, or moss) should be avoided to prevent the chameleon from accidentally eating it while catching prey. Several basking areas of various temperatures must also be provided in a chameleon's enclosure. Some chameleons are happier at higher temperatures, others at lower temperatures. Be sure to research the specifics for your breed. Chameleons get their water from droplets on leaves so as a rule they will not take water from a dish. Adequate water intake must be provided either through a drip system or by misting the enclosure at least twice daily. Drip systems can be purchased or fashioned from a water container with a pinhole placed on top of the cage, or even by placing ice cubes on top of the cage to melt slowly and drip into the cage. If a drip system is used, keep the watering location consistent so the chameleon knows where to find water. Misting will also help keep the humidity levels up. With a drip system, excess water should be collected and removed to prevent the humidity from getting too high. Chameleons need exposure to UVA and UVB rays. In addition, allowing some exposure to natural sunlight through an open window (glass filters out nearly all of the necessary UV radiation) will help keep chameleons happy and healthy. The UVB lights should be on for 10 to 12 hours a day. Follow manufacturer directions to make sure you do not cause thermal burns on your chameleon. Chameleons seem to do best on a variety of insects so you should try to feed as many types of insects as possible to your pet. Crickets, mealworms, super worms, wax worms, wax moths, and roaches are all good items to feed. Prey food should be gut loaded prior to feeding and should be dusted with a calcium (especially for egg laying females) and vitamin D supplement. Some nutritious leafy greens (avoid spinach, lettuce, and cabbage) and other vegetables and fruits can be offered in small amounts as chameleons will occasionally eat these. Many chameleons suffer from calcium and vitamin A deficiencies, usually the results of a poor diet. They're also prone to mouth rot, or stomatitis, an infection around the mouth that shows redness and excess saliva or drooling. Another common ailment among chameleons is metabolic bone disease. This condition, which can be fatal if not treated appropriately, causes a chameleon's bones to become spongy. They'll look lethargic and may lose their appetite. As with any condition where your pet seems ill or stressed, it's best to consult a veterinarian who specializes in reptiles. Try to avoid home remedies before you've consulted a vet. You can check out our other chameleon breed profiles here if you're still deciding which is the right pet for you.